A new study from Accusoft has revealed that 34 per cent of IT managers have had sensitive information compromised as a result of poor document management. 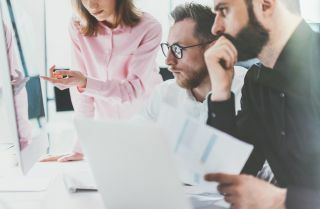 A new study has revealed that more than 34 per cent of IT managers have had sensitive information compromised as a result of poor document management. The study, which was conducted by the image solution development company Accusoft, was aimed at uncovering the standard workplace practices of organisations concerning how they managed their documents. The company surveyed over 100 IT managers and 250 full-time employees in the US in order to better understand workplace practices around document management. According to those surveyed, 90 per cent of IT managers reported that they were confident that they had the necessary tools to protect their organisations' documents. However, 34 per cent admitted to having had sensitive information compromised due to poor file management practices. Vague document management processes also affected employees working for the organisations that Accusoft studied with 66 per cent of employees saying that two to three versions of a document were created before it received final approval. It was also revealed that 20 per cent of employees had no ideas as to what document tools their employer used. The study also investigated the bring your own device (BYOD) movement which has grown in popularity in recent years. According to Accusoft's data, 74 per cent of organisations have implemented some form of a BYOD policy though only half require their employees to have their devices checked by the IT department.